Marjorie A. Ohms, 87, of Fremont, OH passed away on Friday, August 11, 2017 at Elmwood Skilled Nursing Home in Fremont. 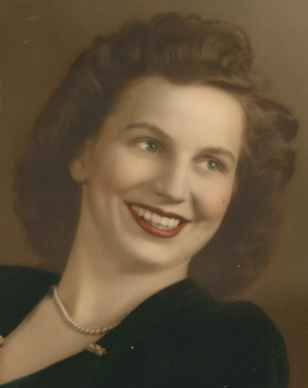 She was born on November 20, 1929 in Bettsville OH to Harry E. and Mabelle F. (Leggett) Burd. She was a 1947 graduate of Bettsville High School, where she was the President of her class and involved in many school activities. During high school, she was working as a telephone switchboard operator above her Uncle Jerry Burd’s drug store in downtown Bettsville. When a resident lifted the receiver to make a phone call, Margie was the “voice with a smile” who said “number please”. After graduating, she worked for AT&T in Tiffin. Marjorie married Robert L. Ohms on March 30, 1950 at St. John’s Lutheran Church in Fremont and he preceded her in death on June 3, 2006. She worked for Sandusky County Jobs and Family Services for twenty-four years where she retired in 2003. Prior to that she was employed at AG Conservation Services for sixteen years. Marjorie was a member of St. John’s Lutheran Church, the American Legion Ladies Auxiliary and Fremont Women of the Moose. She enjoyed doing cross word puzzles and in her younger years enjoyed roller skating. Marjorie loved living on a farm her entire life and loved spending time with her grandchildren. She had a wonderful sense of humor and enjoyed drawing cartoons and writing poetry and send them to her family and friends. We always had a big laugh when she tried telling a joke and got the punch line in the wrong order. Her motto was “Love you more”. Marjorie is survived by her son, Roger A. (Toni) Ohms, Helena, OH; brother, Harry L. “Butch” Burd, Tiffin, OH; six grandchildren and eleven great grandchildren. She was preceded in death by her parents; husband, Robert L. Ohms; son, Larry R. Ohms; sister, Adelyn L. Stump; brothers, Richard L. Burd, William E. and Robert E. Burd; grandson, Larry R. Ohms II. Family would like to thank the staff of Elmwood Assisted Living and ProMedica Memorial Hospice for their care for Marjorie. A Memorial Service will be held Friday, August 18, 2017, 10:30 a.m. at St. John’s Lutheran Church, 212 North Clover St, Fremont, OH with Pastor Matt Wheeler officiating. So sorry for your loss. I worked with Margie for years at Job & Family Services. What a truly wonderful person. She will be missed. My deepest sympathy Dan and Korrine on the loss of your Grandma, Roger my sympathy on the loss of your mom. She was a super special lady, with a huge heart, and awesome sense of humor. Heaven gained another angel to watch over all of us. My prayers are with your whole family. Roger, So sorry to hear of your Mom’s passing. Praying for comfort for you and your family at this time. Deepest sympathy and prayers on the loss of your mother Roger. Roger, our condolences to you and you family on the loss of your mother. She sounds like a wonderful person and we’re sorry for your loss.